The President of the Republic of Liberia and Commander-In-Chief of the Armed Forces of Liberia, H.E. 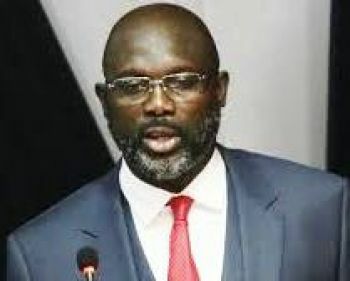 George Manneh Weah, has by Proclamation declared Monday, February 11, 2019 as Armed Forces Day and is to be observed throughout the Republic as a National Holiday. The Proclamation further directs all military and paramilitary organizations within the Republic to organize and execute appropriate programs including parades and other ceremonies in recognition of the Day; accordingly, all government offices, public and business houses are to be closed during the observance. The release says the Proclamation is in consonance with an Act of National Legislature of the Republic of Liberia which declared the 11TH day of February of each year as “Armed Forces Day” to be celebrated as a National Holiday. According to the Proclamation, the observance is in recognition of the vital role of the Armed Forces of Liberia, (AFL) in defending and protecting Liberia’s territorial integrity and its people from foreign aggression as well as upholding the social and political liberty of the people of Liberia as enshrined in the constitution of Liberia. The release also stressed that with the professional development of men and women in arms , the Armed Forces of Liberia (AFL) has been reinvigorated to discharge its constitutional responsibilities of safeguarding the Liberian borders, including remaining vigilant for possible foreign aggression against the state as well as contributing to the Government Pro-Poor Agenda on infrastructure expression and development. According to the Proclamation, during the observance, special attention and honor will be given to the veterans of the AFL and the Coast Guard who have seen active and experienced actual service therein and upheld the tenants of democracy and human rights during service. The Government of Liberia found it necessary to recognize the talents, service, patriotism, loyalty and gallantry to the upkeep of the this Noble Heritage by those men and women who are now memorialized through the establishment of the Department of Veterans Affairs as ordered by the Act of the National Legislature of the Republic of Liberia of 22nd of July 2008, the Proclamation declared. “With the passage of the National Defense Act Of 2008 the Armed Forces of Liberia remain steadfast in supporting the foundation for long-term security and economic development in Liberia as well as fostering regional peace through peacekeeping missions for the consolidation of enhancing and strengthening democracy throughout the region “, the Proclamation further also added.